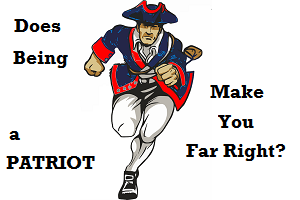 2074 – April 11, 2019 – FAR RIGHT – FAR LEFT – FAR OUT – Why does being a patriot label you as far right? And why do we need labels in the first place? John Birch Society? Far Right? MAGA hat? Far Right? Labels divide us, and divided they want us. Otherwise we would be too big a force to be reckoned with. Let’s worry less about labels and do what is truly “RIGHT.” Which is to love God, Family, and Country.